Alvaro Pablo, my son, was going to the beach with her auntie (my sister). That afternoon he was running a fever but the doctors said it wasn't important. My son seemed like a healthy and strong boy. Therefore, they said it was due to a possible virus, the fact that he was growing, etc. Nevertheless, this started to change when other symptoms such as fatigue, paleness and more fever started to appear; and her aunt started to worry. When he came back we went directly to the hospital where they ran a lot of tests and concluded that he had acute lymphoblastic leukaemia. That moment was when I started to ask myself: Why? Why? Why him? These were words that came in and destroyed my soul. My child was severely ill. Nonetheless, I went back to the hospital room and put on my best smile so that I wouldn't worry him and told him we were going to a cooler hospital, where there were a lot of antibiotics and the best medical team to cure him. I explained that he had some tiny bugs in his blood which we had to get rid of, and he understood it perfectly with only 6 years old. On July 14th 2011 we moved into the isolation room, number 308, cold and with white walls, which would become our house for a long time. The first thing we did was decorate it with photos and letters from his friends and family which we received, daily, thanks to my sister. Every day we did different things. The first call in the morning was from his two super grandparents, Juan and Angelita, to give us love and support, always with that positive attitude which only they could give us. On November 11th 2011 the COMPLETE REMISSION finally arrived and we began the consolidation cycle. Like this the days and months started to pass, with good and bad news, and secondary effects due to the quantity of chemotherapy. 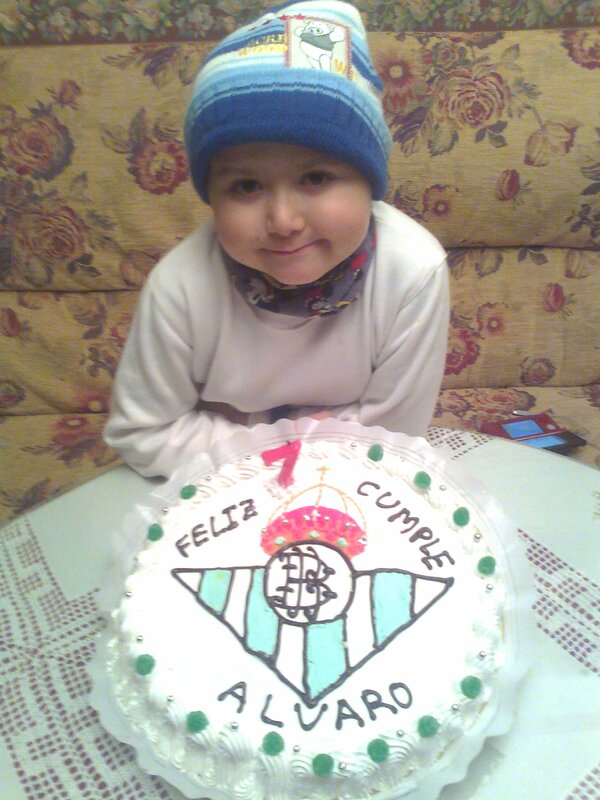 On December 15th 2011, Alvaro Pablo turned 7 years old. During the school course 2011/2012 he wasn't able to go to school, but he worked like a champion and they published in the magazine a letter which we wrote with a lot of love. The last time Alvaro went down to the ICU for a bone marrow aspiration, was on June 27th 2012, almost one year after the diagnosis of the illness, to check how his bone marrow was doing. That day the Spanish soccer team was playing and the team at the ICU laughed a lot with my son, who is a very special and funny kid. They all said that Spain was going to win. I looked at his face, while I held his hand as usual, and I took a look at the recipients carrying a piece of my son to the lab, and I knew that inside them was a very special result. 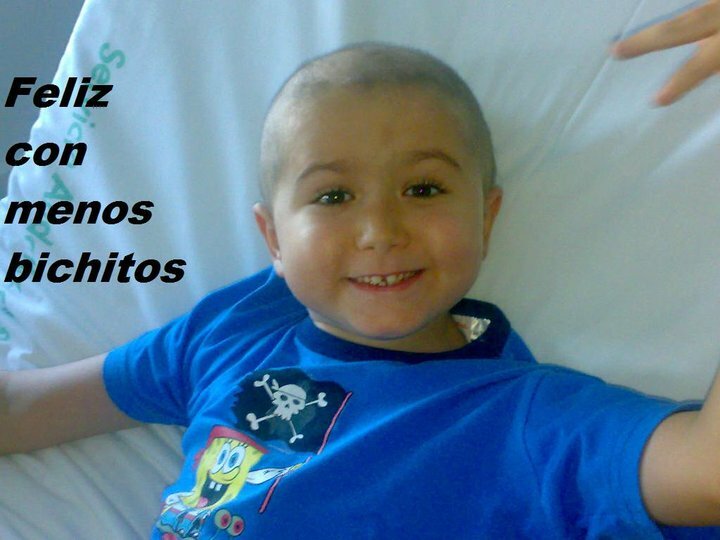 The days passed by very slowly for me until, finally, on July 10th 2012, I listened once again to those words that for me are magical: "Alvaro Pablo has entered COMPLETE REMISSION", but it came with infection, blood transfusions, antibiotics... but my champion won once again. He began the maintenance phase and we went right to enjoy a new summer, much different from the one last year. Every day I wake up and look at him, just by looking at him he gives me life, because he is full of it, life, strength, love and hope. He is a role model and a fighter. He is winning you leukaemia, although I fear you a little and every time I mention you I shiver, but one day I will forget you and will be able to say to you GOOD BYE FOREVER. To everyone in the third floor of Paediatric Onco-haematology at the Materno Infantil Hospital in Jaén, and to the workers at the ICU, I want to say thank you for you are a very professional and caring team, and angels who take care of and cure our children. Thanks to everyone who was there, day by day, supporting us and loving us, you are awesome. As you can see, the plans we made in the room 308 are coming true. In September, Alvaro will go back to school with his classmates and he is very happy. Thank you José Carreras Foundation for your work!